ECRS® is committed to offering our customers the most efficient, effective and economical training possible. Through CATAPULT® University Online, commonly referred to as “CAT-U Online”, ECRS offers training, education, and certification of your most valuable investment – for free. 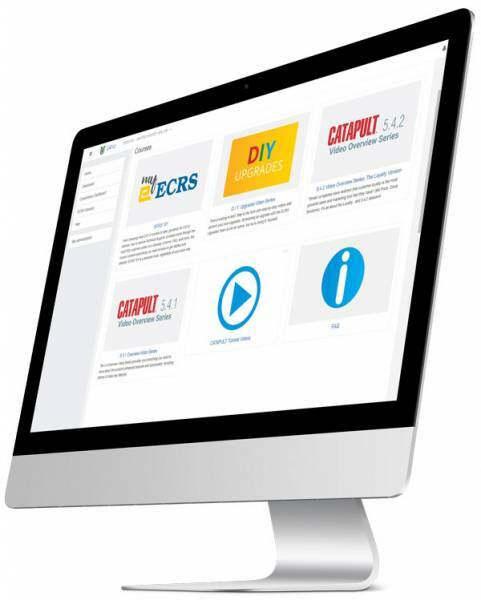 Self-Paced: Employees can access the essentials of all primary CATAPULT features at any time. Optimized for Material Retention: The incorporation of quizzes and other learning tools help boost material recall. Transparent Certification Process: CAT-U Admins (Store Managers) can see employee’ course completion status, which facilitates an accountable, supportive, and collaborative experience. Constantly Updated: New courses, video resources, and updates to the ECRS Glossary are regularly added and announced. Free for all Customers: Eliminate labor-intensive costs associated with industry turnover. CAT-U Online is available to all ECRS customers who maintain an active Support and Customer Care package. If you are an ECRS customer and would like to learn more about this product, please contact training@ecrs.com or go to myECRS and click on the CAT-U Online logo to get set up with CAT-U Online.